Please contact the Treasurer (Treasurer@nystesol.org) or the Business Manager (Businessmanager@nystesol.org) if you have questions regarding refunds. *The non-member price includes a one-year membership. ● Make sure that your title is limited to 10 words and abstract should be no longer than 50 words. The Hilton offers free Wifi throughout the hotel. If access codes are required at the time of the event, they will be supplied at the registration desk on the day of the conference. You must bring your own laptop/technology if you wish to connect to the projector. Please be sure to bring any cables and adapters required for your hardware. Please do not plan to use Bluetooth to connect; the projector may not be Bluetooth compliant. Please be sure to check your technology and the connection to the projector prior to your presentation. NYS TESOL cannot be responsible for any difficulties related to the hardware you bring or its connection to the supplied projector. You are responsible for providing hand-outs and materials for your presentation. NYS TESOL will not have access to a copier nor office supplies, so please plan accordingly. Plan to bring at least 30 copies. You are contacted as the lead presenter, please inform all of your co-presenters (if applicable) that this presentation has been accepted. ● Make sure that you receive our discounted rate of $ 139/night by mentioning the group cod “TESOL”! ● You may also reserve rooms by calling the hotel directly at 1-631-845-1000. If you confirm your participation and then do not attend without any notice, your proposal will not be accepted the following year. We appreciate your respect and understanding. ● Top center of the poster should have a title, the name and institutional affiliation of the presenter(s), and contact information. ● Use clearly labeled visuals: graphs, charts, photos, drawings. ● The poster generally should read from left to right, and top to bottom. ● Text should be readable from 4-5 feet away. Use a minimum font size of 18-20 points. ● Lettering for the title should be large (at least 70-point font). ● Posters are self-standing and tri-fold (not attached to a wall). They can be purchased at any craft store. NYS TESOL does not cover poster costs and does not provide boards for the poster sessions. Both the production of the poster and associated costs are the responsibility of the presenters. Virtual presentations are open to authors whose proposals have been accepted (or those who are invited to present) but can’t attend the conference. Virtual presenters who do not attend the conference will still be required to pay a $ 100 virtual presentation registration fee. ● Your 15 minutes video presentation may be having you presenting in front of a camera or your voice over the PowerPoint or a combination of any other creative methods of presentation. ● Please send the link to your videos via e-mail to techsupport@nystesol.org. 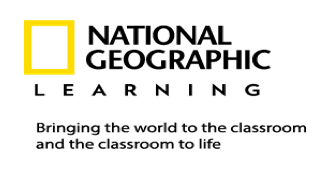 We recommend hosting your virtual presentation on YouTube or Google Drive (as a PPT file). Please make your Virtual Presentations files public so we can link to them. We cannot host your video files or PPT on our web site. We will link to them via our conference web page. Please do not send video files as they are too large. During the conference dates, we will broadcast your video presentations at the Conference Hall. ● Conference Pre-registration is a requirement for all presenters. Virtual presenters who do not attend the conference will still be required to pay a $100 virtual presentation pre-registration fee. View the AC17 schedule below. NYS TESOL will provide a CTLE certificate upon request. Conference participants must submit their requests at the registration table. The certificate issued will be based on registration and attendance. For example, if a participant is present on Friday then the certificate will reflect CTLE hours for Friday only. If the participant was present on Friday and Saturday then the CTLE certificate will reflect hours for both days. Ester J. de Jong is Professor in ESOL/Bilingual Education, and the Director of the School of Teaching and Learning. She teaches courses in ESOL/bilingual education and in curriculum, methods, and assessment for English speakers of other languages. Prior to academia, she worked for the K-12 public schools in Massachusetts as the Assistant Director for Bilingual Education and ESL programs. Her research focuses on two-way bilingual education, language-in-education policy, and mainstream teacher preparation for bilingual students. Her book “Foundations for Multilingualism in Education: From Principles to Practice” (Caslon Publishing, 2011) addresses policies and practices of responding to increasing linguistic diversities in schools. She is currently co-PI for a Center of Excellence in Elementary Teacher Preparation grant. She is currently the President of TESOL International Association. Osman Canales is the founder of Long Island Immigrant Student Advocates and volunteers his time as the Organizer working with immigrant youth. Mr. Canales graduated from SUNY Old Westbury with a major in Politics, Economics and Law. In 2012 Mr. Canales received his Associate degree on Liberal Arts from Suffolk Community College. Mr. Canales has become a strong immigrant rights and social justice activist here on Long Island. He came from El Salvador when he was 10 years old and his experience as an immigrant motivated him to advocate for immigrant rights and immigrant students. The Long Island Immigrant Student Advocates-LIISA is a non- for profit organization committed towards equality and the right to a higher education for all students. Their purpose is to educate and empower and engage youth, educators and the community to take action and create a stronger, more diverse leadership movement on Long Island. Dr. Alsace, a retired educator from the Buffalo, New York Public Schools, began her career as a bilingual elementary teacher. After receiving her Master’s Degree in Bilingual Special Education, she taught ELL/bilingual learners with disabilities. Tamara was also Program Coordinator at Bilingual Early Childhood Center #36; Bilingual Professional Development Specialist for the Special Education Training and Resource Center; and Director of Multilingual Education. As Director, she oversaw the Bilingual, ESOL, and World Languages programs and the Language Assessment Center. She led many initiatives benefitting ELL/bilingual learners and all students, including the expansion of dual language programs and piloting the New York State Seal of Biliteracy. An active community member, Dr. Alsace has served on several non-profit boards, including AIDS Family Services, Benedict House, and Buffalo State College’s Community Academic Center. She currently serves on the board of Explore and More Children’s Museum, as board Vice-Chairperson for the National Federation for Just Communities, and as Secretary of the Hispanic Heritage Council of Western New York, Inc. She is a member of the Hispanic Women’s League and NYS TESOL. Tamara, currently president of the New York State Association for Bilingual Education, views bilingual education as more than a career, but as a calling; more than just a service for students, but as an opportunity and a right; and biliteracy as more than just an aspirational goal, but as a critical skill for success beyond college and for full participation in the global society. Dr. Alsace, a native Buffalonian, is the proud mother of two children (now adults), and the proud daughter of Dominican parents. As the descendant of grandparents born in Cuba, Puerto Rico, Dominican Republic, and Martinique - who all connected in Santo Domingo, she is dedicated to preserving and celebrating the aspects of culture that unite us, while recognizing the unique qualities that define us. Dr. Shondel Nero is Associate Professor and Director of the Program in Multilingual Multicultural Studies at New York University’s Steinhardt School of Culture, Education, and Human Development. Her research examines the politics, challenges, and strategies of educating students who speak Caribbean Creole Englishes in the US and the Caribbean; World Englishes; and nonstandard varieties of English. Dr. Nero’s research has appeared in TESOL Quarterly, World Englishes, Language Policy, and other prominent peer reviewed journals as well as in three books, including, most recently, Vernaculars in the Classroom: Paradoxes, Pedagogy, Possibilities (co-authored with Dohra Ahmad). She is the inaugural recipient of the James E. Alatis Prize (2016) for an outstanding article on language education policy based on her research as a Fulbright scholar in Jamaica. Dr. Nero also directs a study-abroad program in the Dominican Republic as a means of developing teachers' linguistic and intercultural competence. Don’t forget to mention the code (TESOL) to receive the special rate: $ 139/night! Complimentary shuttle services are available upon request. Shuttle schedules are as follows: Friday 6:30am - 10:30am and 4pm - 8pm. Turn Right at end of ramp onto Rt. 110 S / Broadhollow Road. Proceed 2 miles to the corner of Spagnoli Rd and Broadhollow Rd and the hotel is on the right. Take the Long Island Expressway West to exit 49 South. Take the Belt Parkway East to the Southern State Parkway. Exit at 32 North and proceed 4.5 miles to the hotel which is on the left side. Distance from Hotel: 25.5 mi. Take Grand Central parkway to the Northern State Parkway East. Exit 40 South and proceed 1.5 miles to the hotel which is on the right side. Distance from Hotel: 31.3 mi. 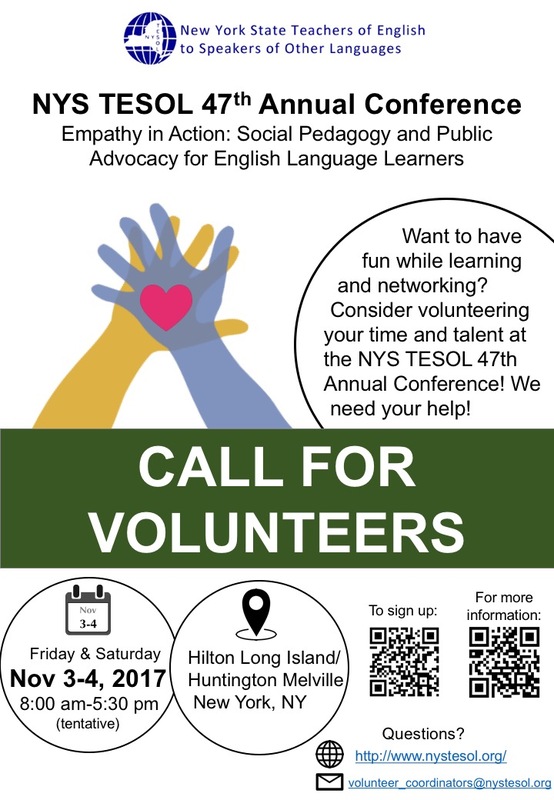 September 2017- Call for Volunteers: NYS TESOL 47th Annual Conference. See flyer here. A: Anyone can volunteer. However, you do need to pre-register for the Conference to be a volunteer at the Conference. While volunteering is open to all, only student volunteers are eligible for registration fee discount. In order to receive discount for the registration fee, you must submit your proof of student status at the time you register for the conference. You must pre-register and volunteer at least one shift during the meeting. Shifts are usually two hours each. Most shifts are in the morning and afternoon, but we do have a few evening shifts available. Q: What are the duties of volunteers at the NYS TESOL Annual Conference? You will be trained for your volunteer assignment(s) when you check in at the start of your shifts, so no particular experience or training is required ahead of time. Volunteers assist NYS TESOL staff with a variety of meeting tasks, including registering attendees, managing registration lines, bagging registration material, checking badges, collecting luncheon/dinner tickets and answering attendee questions. You will be provided with a name tag identifying you as a volunteer at the beginning of your first shift. Q: When should I expect to receive my volunteer schedule? You will receive a Google invitation to edit that allows you to sign up shifts via email at least two weeks prior to the conference start date. Shifts are available to sign up at a first-come, first-served basis. So we cannot guarantee you specific shifts when you sign up. Q: Where should I check in prior to my volunteer shifts? All volunteers should report to the NYS TESOL registration desk and sign-in with Jessica Cho Hang or Derek Baylor. Please arrive at least 10 minutes prior to each shift. If you are unable to make your scheduled shifts, you must alert Volunteer Coordinators, Jessica Cho Hang or Derek Baylor, as soon as possible. Thanks to everyone who participated in the 2017 NYS TESOL Student Logo Contest and helped make this contest a success! We received many outstanding entries. Our only regret is that there can only be one winner. Every student who entered will receive a Certificate of Participation. We are pleased to announce that Maxine Leu has been selected as the winner of the 2017 NYS TESOL Student Logo Contest. Her logo design (see below) eloquently and insightfully addresses the conference theme through visual representation and has received the most votes among our panel of judges. The picture, "Empathy in action", expressed the cooperation of diverse races in painting. The topic based on the artist's past experience in which she used to paint a 23 x 8 foot mural with her young art students back in Taiwan. In the process, she experienced children’s helping each other with pleasure by understanding and learning how to work with others. There are several symbolisms that show every element of interaction with each other. In America, a borderless melting pot, people have totally different backgrounds in language, culture, and experience. However, understanding individuals has never been an obstacle. It's as pure as kids helping each other. Maxine Leu is an ESL student at the Haggerty English Language Program at SUNY New Paltz. Maxine’s ESL professors at SUNY New Paltz always try different methods to make students feel learning English is fun and relaxing. As a student who worked in the education field with an artistic talent, Maxine thought art could also make every class interesting. She once made 3D puzzles of maps for people to better understand her home country, Taiwan, in her school’s Multicultural Festival. At that time, her interactive posters and props got people's attentions. Maxine has expressed that she would like to use this award for studying 3D printing and makes more playful teaching props in the future. Exhibitors must commit to being present on both days of the conference. Due to the limited storage facilities at the hotel, we ask you not to ship any material to arrive at the hotel any earlier than three days prior to the conference event. Please be advised that it is completely your responsibility to make sure your material will arrive in the 3-day window as specified above. We are not responsible for any lost, stolen, or damaged packages. Please clearly label the number of boxes in the shipment (i.e. 1 of 2, 2 of 3, etc.). Set up can occur on Thursday, November 2, 2017 from 1:00 pm to 5: 00 pm. If you have a conflict and need to make some alternative accommodation, please contact Exhibitor Liaison, Ms. Tilla Alexander, at exhibitorliaison@nystesol.org as soon as possible. NYS TESOL discourages set up on Friday morning; however, if this is necessary then set up must be completed by 7:30am. . Overnight security will be provided in the conference center for both Thursday and Friday nights. Purchase by August 31st for Early Bird Rate. After August 31st, there will be a $100 increase.